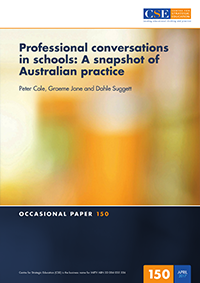 The authors summarise and comment on the results of a national project that they undertook for the Australian Institute for Teaching and School Leadership (AITSL), involving analysis of the status and nature of professional conversations in a sample of Australian schools – part of a larger AITSL initiative to help establish a performance and development culture. Their specific task was to collect data on the different types of professional conversation engaged in by teachers; to uncover views of the most effective approaches; and to highlight those that are perceived to have impact on teaching effectiveness and student outcomes. They provide numbers of ‘tips’ for practitioners, emerging from participants’ experience and feedback.